Jamaica has the highest proportion of households that have only a cell phone for telephone service among countries that report this statistic. According to the Jamaican 2011 Census, 96% of households had a telephone and 78% had only a mobile telephone. Households with both a fixed telephone subscription and mobile phone account for 14% and four percent have only a fixed line. Jamaica's high level of universal telephone service is remarkable given that only 14% of households had a mobile phone in 2001. Click to enlarge. Data adapted from national statistical offices except USA (Center for Disease control). Data for Czech Republic, Indonesia, Sri Lanka and Canada refer to 2010; for Singapore 2008; all others 2011. 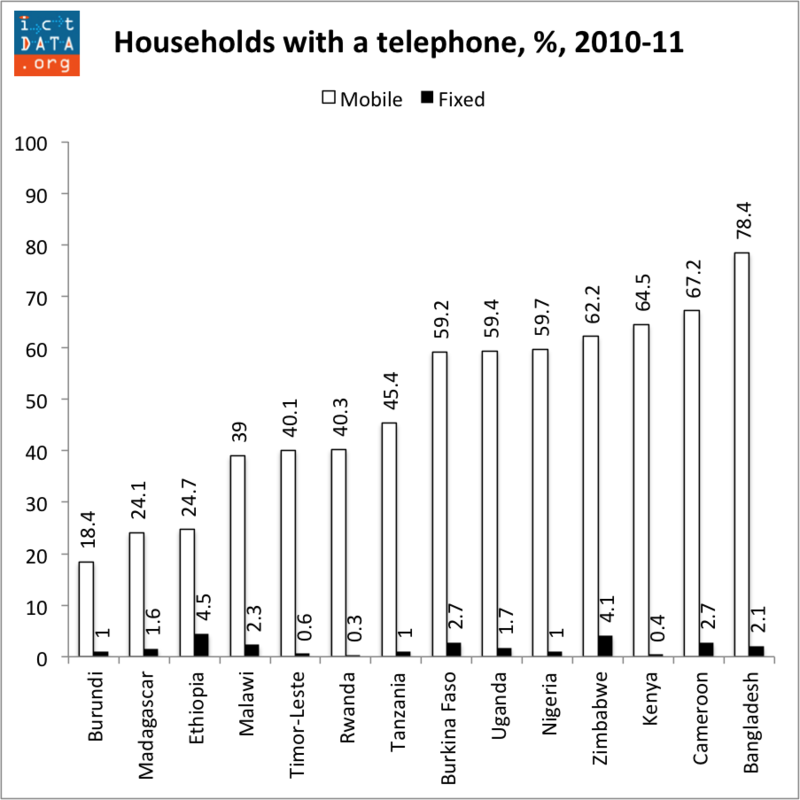 Mobile is allowing developing countries to catch up with developed ones in home telephone penetration. At the same time, fixed telephone subscriptions are falling dramatically in developed countries. In the USA mobile-only account for a third of telephone households and in the Czech Republic, three out of four homes have only a mobile for telephone service. 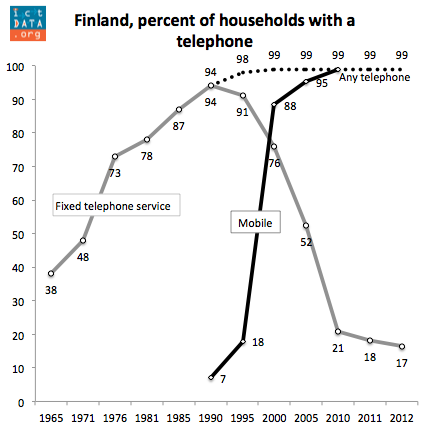 Nowhere is this dramatic decline of fixed telephone households more stunning than in Finland. It took Finland 25 years to boost home fixed telephone penetration from 38 in 1965 before peaking at 94 in 1990, still falling short of full universal service. At that point, Finnish households began abandoning their fixed telephone lines in favor of mobile. Although mobile services were introduced in Finland in 1980, they did not really take off until the introduction of GSM mobile services in 1992. By 1999 households with a mobile phone had surpassed those with a fixed telephone. By 2000, household telephone penetration had become ubiquitous with mobile filling in for the five percent of households that fixed telephony could never reach. By 2012, only 17 percent of Finnish households had a fixed telephone service whereas almost all had a mobile phone. Click to enlarge. Adapted from Statistics Finland. 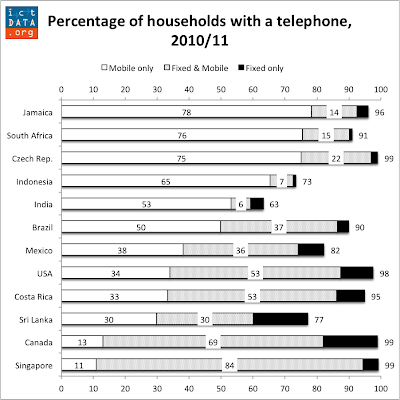 Most national authorities do not provide a breakdown of mobile-only households. Nonetheless, the vast majority of home telephone subscriptions in developing countries are mobile given the low penetration of fixed telephone service. 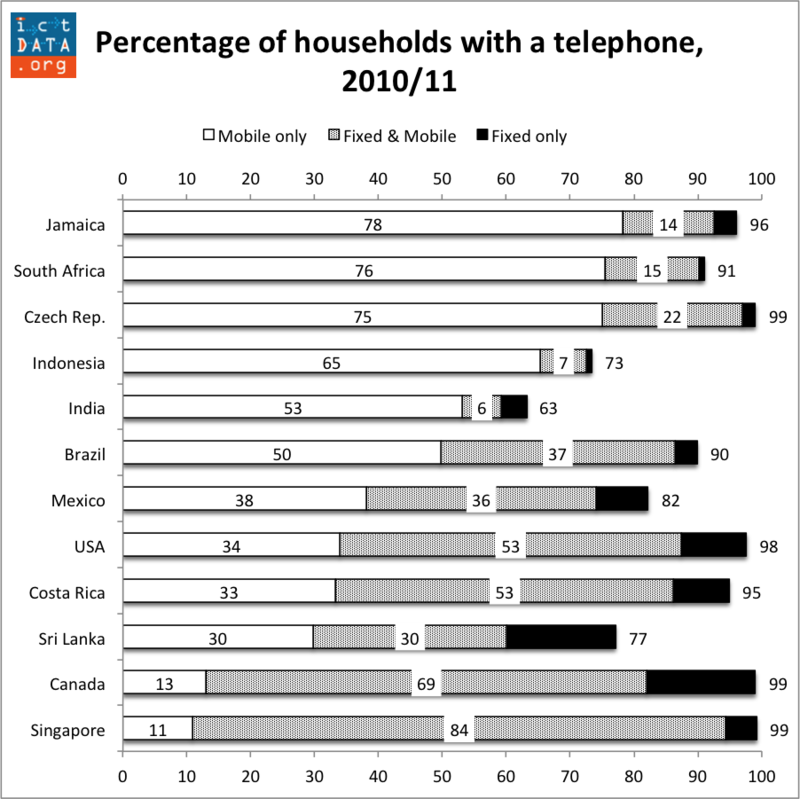 This is illustrated in the chart below which shows household telephone penetration in low fixed countries (home fixed telephone penetration < 5%). These are truly mobile-only countries, mainly in Africa, where fixed is insignificant. 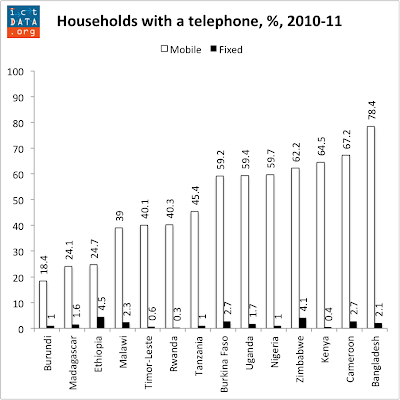 Take Kenya where only 0.4% of households have a fixed telephone service compared to 64.5% with a cell phone. Click to enlarge. Adapted from national Demographic & Health Surveys. Madagascar, Ethiopia, Uganda, Zimbabwe, Cameroon & Bangladesh refer to 2011; all others 2010.